If you use an anonymity network such as Tor on a regular basis, you are probably familiar with various annoyances in your web browsing experience, ranging from pages saying “Access denied” to having to solve CAPTCHAs before continuing. Interestingly, these hurdles disappear if the same website is accessed without Tor. The growing trend of websites extending this kind of “differential treatment” to anonymous users undermines Tor’s overall utility, and adds a new dimension to the traditional threats to Tor (attacks on user privacy, or governments blocking access to Tor). There is plenty of anecdotal evidence about Tor users experiencing difficulties in browsing the web, for example the user-reported catalog of services blocking Tor. However, we don’t have sufficient detail about the problem to answer deeper questions like: how prevalent is differential treatment of Tor on the web; are there any centralized players with Tor-unfriendly policies that have a magnified effect on the browsing experience of Tor users; can we identify patterns in where these Tor-unfriendly websites are hosted (or located), and so forth. Today we present our paper on this topic: “Do You See What I See? Differential Treatment of Anonymous Users” at the Network and Distributed System Security Symposium (NDSS). Together with researchers from the University of Cambridge, University College London, University of California, Berkeley and International Computer Science Institute (Berkeley), we conducted comprehensive network measurements to shed light on websites that block Tor. At the network layer, we scanned the entire IPv4 address space on port 80 from Tor exit nodes. At the application layer, we fetch the homepage from the most popular 1,000 websites (according to Alexa) from all Tor exit nodes. We compare these measurements with a baseline from non-Tor control measurements, and uncover significant evidence of Tor blocking. We estimate that at least 1.3 million IP addresses that would otherwise allow a TCP handshake on port 80 block the handshake if it originates from a Tor exit node. We also show that at least 3.67% of the most popular 1,000 websites block Tor users at the application layer. The MIKEY-SAKKE protocol is being promoted by the UK government as a better way to secure phone calls. The reality is that MIKEY-SAKKE is designed to offer minimal security while allowing undetectable mass surveillance, through the introduction a backdoor based around mandatory key-escrow. This weakness has implications which go further than just the security of phone calls. The current state of security for phone calls leaves a lot to be desired. Land-line calls are almost entirely unencrypted, and cellphone calls are also unencrypted except for the radio link between the handset and the phone network. While the latest cryptography standards for cellphones (3G and 4G) are reasonably strong it is possible to force a phone to fall back to older standards with easy-to-break cryptography, if any. The vast majority of phones will not reveal to their user whether such an attack is under way. The only reason that eavesdropping on land-line calls is not commonplace is that getting access to the closed phone networks is not as easy compared to the more open Internet, and cellphone cryptography designers relied on the equipment necessary to intercept the radio link being only affordable by well-funded government intelligence agencies, and not by criminals or for corporate espionage. That might have been true in the past but it certainly no longer the case with the necessary equipment now available for $1,500. Governments, companies and individuals are increasingly looking for better security. A second driver for better phone call encryption is the convergence of Internet and phone networks. The LTE (Long-Term Evolution) 4G cellphone standard – under development by the 3rd Generation Partnership Project (3GPP) – carries voice calls over IP packets, and desktop phones in companies are increasingly carrying voice over IP (VoIP) too. Because voice calls may travel over the Internet, whatever security was offered by the closed phone networks is gone and so other security mechanisms are needed. Like Internet data encryption, voice encryption can broadly be categorised as either link encryption, where each intermediary may encrypt data before passing it onto the next, or end-to-end encryption, where communications are encrypted such that only the legitimate end-points can have access to the unencrypted communication. End-to-end encryption is preferable for security because it avoids intermediaries being able to eavesdrop on communications and gives the end-points assurance that communications will indeed be encrypted all the way to their other communication partner. Current cellphone encryption standards are link encryption: the phone encrypts calls between it and the phone network using cryptographic keys stored on the Subscriber Identity Module (SIM). Within the phone network, encryption may also be present but the network provider still has access to unencrypted data, so even ignoring the vulnerability to fall-back attacks on the radio link, the network providers and their suppliers are weak points that are tempting for attackers to compromise. Recent examples of such attacks include the compromise of the phone networks of Vodafone in Greece (2004) and Belgacom in Belgium (2012), and the SIM card supplier Gemalto in France (2010). The identity of the Vodafone Greece hacker remains unknown (though the NSA is suspected) but the attacks against Belgacom and Gemalto were carried out by the UK signals intelligence agency – GCHQ – and only publicly revealed from the Snowden leaks, so it is quite possible there are others attacks which remain hidden. Email is typically only secured by link encryption, if at all, with HTTPS encrypting access to most webmail and Transport Layer Security (TLS) sometimes encrypting other communication protocols that carry email (SMTP, IMAP and POP). Again, the fact that intermediaries have access to plaintext creates a vulnerability, as demonstrated by the 2009 hack of Google’s Gmail likely originating from China. End-to-end email encryption is possible using the OpenPGP or S/MIME protocols but their use is not common, primarily due to their poor usability, which in turn is at least partially a result of having to stay compatible with older insecure email standards. In contrast, instant messaging applications had more opportunity to start with a clean-slate (because there is no expectation of compatibility among different networks) and so this is where much innovation in terms of end-to-end security has taken place. Secure voice communication however has had less attention than instant messaging so in the remainder of the article we shall examine what should be expected of a secure voice communication system, and in particular see how one of the latest and up-coming protocols, MIKEY-SAKKE, which comes with UK government backing, meets these criteria. MIKEY-SAKKE is the security protocol behind the Secure Chorus voice (and also video) encryption standard, commissioned and designed by GCHQ through their information security arm, CESG. GCHQ have announced that they will only certify voice encryption products through their Commercial Product Assurance (CPA) security evaluation scheme if the product implements MIKEY-SAKKE and Secure Chorus. As a result, MIKEY-SAKKE has a monopoly over the vast majority of classified UK government voice communication and so companies developing secure voice communication systems must implement it in order to gain access to this market. GCHQ can also set requirements of what products are used in the public sector and as well as for companies operating critical national infrastructure. UK government standards are also influential in guiding purchase decisions outside of government and we are already seeing MIKEY-SAKKE marketed commercially as “government-grade security” and capitalising on their approval for use in the UK government. For this reason, and also because GCHQ have provided implementers a free open source library to make it easier and cheaper to deploy Secure Chorus, we can expect wide use MIKEY-SAKKE in industry and possibly among the public. It is therefore important to consider whether MIKEY-SAKKE is appropriate for wide-scale use. For the reasons outlined in the remainder of this article, the answer is no – MIKEY-SAKKE is designed to offer minimal security while allowing undetectable mass surveillance though key-escrow, not to provide effective security. The opening event for the UCL Academic Centre of Excellence for Cyber Security Research in the 2015–2016 academic term featured three speakers: Earl Barr, whose work on approximating program equivalence has won several ACM distinguished paper awards; Mirco Musolesi from the Department of Geography, whose background includes a degree in computer science and an interest in analysing myriad types of data while protecting privacy; and Susan Landau, a professor at Worcester Polytechnic Institute and a visiting professor at UCL and an expert on cyber security policy whose books include Privacy On the Line: the Politics of Wiretapping and Encryption (with Whitfield Diffie) and Surveillance or Security? The Risks Posed by New Wiretapping Technologies. Earl Barr is a member of the software systems engineering group and the Centre for Research on Evolution, Search, and Testing. His talk outlined his work using program similarity to determine whether two arbitrary programs have the same behaviour in two areas relevant to cyber security: malware and intellectual property theft in binaries (that is, code reused in violation of its licence). Barr began by outlining his work on detecting malware, comparing the problem to that facing airport security personnel trying to find a terrorist among millions of passengers. The work begins with profiling: collect two zoos, and then ask if the program under consideration is more likely to belong to the benign zoo or the malware zoo. Rather than study the structure of the binary, Barr works by viewing the program as strings of 0s and 1s, which may not coincide with the program’s instructions, and using information theory to create a measure of dissimilarity, the normalised compression distance (NCD). The NCD serves as an approximation of the Kolmogorov Complexity, a mathematical measure of the complexity of the shortest description of an object, which is then normalised using a compression algorithm that ignores the details of the instruction set architecture for which the binary is written. Using these techniques to analyse a malware zoo collected from sources such as Virus Watch, Barr was able to achieve a 95.7% accuracy rate. He believes that although this technique isn’t suitable for contemporary desktop anti-virus software, it opens a new front in the malware detection arms race. Still, Barr is aware that malware writers will rapidly develop countermeasures and his group is already investigating counter-countermeasures. Malware writers have three avenues for blocking detection: injecting new content that looks benign; encryption; and obfuscation. Adding new content threatens the malware’s viability: raising the NCD by 50% requires doubling the size of the malware. Encryption can be used against the malware writer: applying a language model across the program reveals a distinctive saw-toothed pattern of regions with low surprise and low entropy alternating with regions of high surprise and high entropy (that is, regions with ciphertext). Obfuscation is still under study: the group is using three obfuscation engines available for Java and applying them repeatedly to Java malware. Measuring the NCD after each application shows that after 100 iterations the NCD approaches 1 (that is, the two items being compared are dissimilar), but that two of the three engines make errors after 200 applications. Unfortunately for malware writers, this technique also causes the program to grow in size. The cost of obfuscation to malware writers may therefore be greater than that imposed upon white hats. Just how secure is Tor, one of the most widely used internet privacy tools? Court documents released from the Silk Road 2.0 trial suggest that a “university-based research institute” provided information that broke Tor’s privacy protections, helping identify the operator of the illicit online marketplace. Silk Road and its successor Silk Road 2.0 were run as a Tor hidden service, an anonymised website accessible only over the Tor network which protects the identity of those running the site and those using it. The same technology is used to protect the privacy of visitors to other websites including journalists reporting on mafia activity, search engines and social networks, so the security of Tor is of critical importance to many. Almost 97% of Tor traffic is from those using Tor to anonymise their use of standard websites outside the network. To do so a path is created through the Tor network via three computers (nodes) selected at random: a first node entering the network, a middle node (or nodes), and a final node from which the communication exits the Tor network and passes to the destination website. The first node knows the user’s address, the last node knows the site being accessed, but no node knows both. The remaining 3% of Tor traffic is to hidden services. These websites use “.onion” addresses stored in a hidden service directory. The user first requests information on how to contact the hidden service website, then both the user and the website make the three-hop path through the Tor network to a rendezvous point which joins the two connections and allows both parties to communicate. In both cases, if a malicious operator simultaneously controls both the first and last nodes to the Tor network then it is possible to link the incoming and outgoing traffic and potentially identify the user. To prevent this, the Tor network is designed from the outset to have sufficient diversity in terms of who runs nodes and where they are located – and the way that nodes are selected will avoid choosing closely related nodes, so as to reduce the likelihood of a user’s privacy being compromised. This type of design is known as distributed trust: compromising any single computer should not be enough to break the security the system offers (although compromising a large proportion of the network is still a problem). Distributed trust systems protect not only the users, but also the operators; because the operators cannot break the users’ anonymity – they do not have the “keys” themselves – they are less likely to be targeted by attackers. With about 2m daily users Tor is by far the most widely used privacy system and is considered one of the most secure, so research that demonstrates the existence of a vulnerability is important. Most research examines how to increase the likelihood of an attacker controlling both the first and last node in a connection, or how to link incoming traffic to outgoing. When the 2014 programme for the annual BlackHat conference was announced, it included a talk by a team of researchers from CERT, a Carnegie Mellon University research institute, claiming to have found a means to compromise Tor. But the talk was cancelled and, unusually, the researchers did not give advance notice of the vulnerability to the Tor Project in order for them to examine and fix it where necessary. This decision was particularly strange given that CERT is worldwide coordinator for ensuring software vendors are notified of vulnerabilities in their products so they can fix them before criminals can exploit them. However, the CERT researchers gave enough hints that Tor developers were able to investigate what had happened. When they examined the network they found someone was indeed attacking Tor users using a technique that matched CERT’s description. The attack turned on a means to tamper with a user’s traffic as they looked up the .onion address in the hidden service directory, or in the hidden service’s traffic as it uploaded the information to the directory. 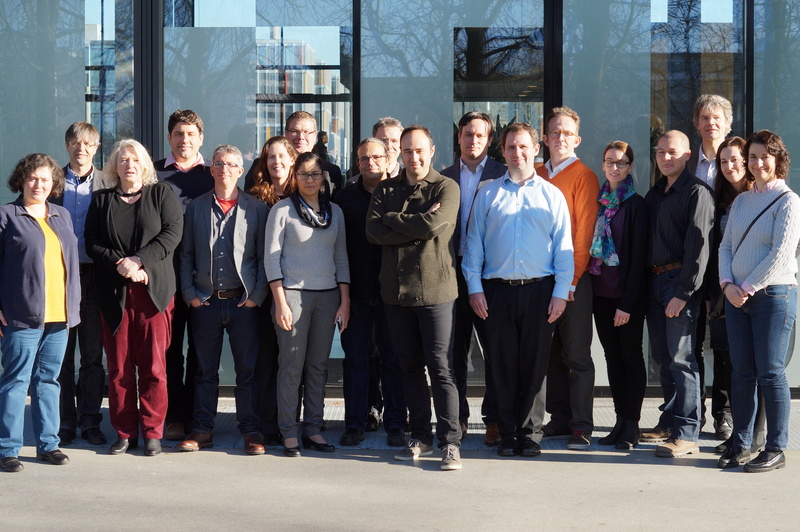 Last week, “Privacy & Us” — an Innovative Training Network (ITN) project funded by the EU’s Marie Skłodowska-Curie actions — held its kick-off meeting in Munich. Hosted in the nice and modern Wisschenschafts Zentrum campus by Uniscon, one of the project partners, principal investigators from seven different countries set out the plan for the next 48 months. Privacy & Us really stands for “Privacy and Usability” and aims to conduct privacy research and, over the next 3 years, train thirteen Early Stage Researchers (ESRs) — i.e., PhD students — to be able to reason, design, and develop innovative solutions to privacy research challenges, not only from a technical point of view but also from the “human side”. The project involves nine “beneficiaries”: Karlstads Universitet (Sweden), Goethe Universitaet Frankfurt (Germany), Tel Aviv University (Israel), Unabhängiges Landeszentrum für Datenschutz (Germany), Uniscon (Germany), University College London (UK), USECON (Austria), VASCO Innovation Center (UK), and Wirtschaft Universitat Wien (Austria), as well as seven partner organizations: the Austrian Data Protection Authority (Austria), Preslmayr Rechtsanwälte OG (Austria), Friedrich-Alexander University Erlangen (Germany), University of Bonn (Germany), the Bavarian Data Protection Authority (Germany), EveryWare Technologies (Italy), and Sentor MSS AB (Sweden). The Innovative Training Networks are interdisciplinary and multidisciplinary in nature and promote, by design, a collaborative approach to research training. Funding is extremely competitive, with acceptance rate as low as 6%, and quite generous for the ESRs who often enjoy higher than usual salaries (exact numbers depend on the hosting country), plus 600 EUR/month mobility allowance and 500 EUR/month family allowance. The students will start in August 2016 and will be trained to face both current and future challenges in the area of privacy and usability, spending a minimum of six months in secondment to another partner organization, and participating in several training and development activities. Three studentships will be hosted at UCL, under the supervision of Dr Emiliano De Cristofaro, Prof. Angela Sasse, Prof. Ann Blandford, and Dr Steven Murdoch. Specifically, one project will investigate how to securely and efficiently store genomic data, design and implementing privacy-preserving genomic testing, as well as support user-centered design of secure personal genomic applications. The second project will aim to better understand and support individuals’ decision-making around healthcare data disclosure, weighing up personal and societal costs and benefits of disclosure, and the third (with the VASCO Innovation Centre) will explore techniques for privacy-preserving authentication, namely, extending these to develop and evaluate innovative solutions for secure and usable authentication that respects user privacy. there is mandatory encryption from the client to the server. However, Tor hidden services as originally implemented did not take full advantage of parallel processing, whether from a single multi-core computer or from load-balancing over multiple computers. Therefore once a single hidden service has hit the limit of vertical scaling (getting faster CPUs) there is not the option of horizontal scaling (adding more CPUs and more computers). There are also bottle-necks in the Tor networks, such as the 3–10 introduction points that help to negotiate the connection between the hidden service and the rendezvous point that actually carries the traffic. For my MSc Information Security project at UCL, supervised by Steven Murdoch with the assistance of Alec Muffett and other Security Infrastructure engineers at Facebook in London, I explored possible techniques for improving the horizontal scalability of Tor hidden services. More precisely, I was looking at possible load balancing techniques to offer better performance and resiliency against hardware/network failures. The focus of the research was aimed at popular non-anonymous hidden services, where the anonymity of the service provider was not required; an example of this could be Facebook’s .onion address. One approach I explored was to simply run multiple hidden service instances using the same private key (and hence the same .onion address). Each hidden service periodically uploads its own descriptor, which describes the available introduction points, to six hidden service directories on a distributed hash table. The hidden service instance chosen by the client depends on which hidden service instance most recently uploaded its descriptor. In theory this approach allows an arbitrary number of hidden service instances, where each periodically uploads its own descriptors, overwriting those of others. This approach can work for popular hidden services because, with the large number of clients, some will be using the descriptor most recently uploaded, while others will have cached older versions and continue to use them. However my experiments showed that the distribution of the clients over the hidden service instances set up in this way is highly non-uniform. I therefore ran experiments on a private Tor network using the Shadow network simulator running multiple hidden service instances, and measuring the load distribution over time. The experiments were devised such that the instances uploaded their descriptors simultaneously, which resulted in different hidden service directories receiving different descriptors. As a result, clients connecting to a hidden service would be balanced more uniformly over the available instances. “I work on technical aspects of privacy,” says George Danezis, a reader in security and privacy engineering at UCL and part of the Academic Centre of Excellence in Cyber Security Research (ACE-CSR). There are, of course, many other limitations: regulatory, policy, economic. But, he says, “Technology is the enabler for everything else – though you need everything else for it to be useful.” Danezis believes providing privacy at the technology level is particularly important as it seems clear that both regulation and the “moralising” approach (telling people the things they shouldn’t do) have failed. There are many reasons why someone gets interested in researching technical solutions to intractable problems. Sometimes the motivation is to eliminate a personal frustration; other times it’s simply a fascination with the technology itself. For Danezis, it began with other people. “I discovered that a lot of the people around me could not use technology out of the box to do things personally or collectively.” For example, he saw NGOs defending human rights worry about sending an email or chatting online, particularly in countries hostile to their work. A second motivation had to do with timing: when he began work it wasn’t yet clear that the Internet would develop into a medium anyone could use freely to publish stories. That particular fear has abated, but other issues such as the need for anonymous communications and private data sharing are still with us. “Without anonymity we can’t offer strong privacy,” he says. As the number of always-on, always-connected smartphones increase, so does the amount of personal and sensitive information they collect and transmit. Thus, it is crucial to secure traffic exchanged by these devices, especially considering that mobile users might connect to open Wi-Fi networks or even fake cell towers. The go-to protocol to secure network connection is HTTPS i.e., HTTP over SSL/TLS. In the Android ecosystem, applications (apps for short), support HTTPS on sockets by relying on the android.net, android.webkit, java.net, javax.net, java.security, javax.security.cert, and org.apache.http packages of the Android SDK. These packages are used to create HTTP/HTTPS connections, administer and verify certificates and keys, and instantiate TrustManager and HostnameVerifier interfaces, which are in turn used in the SSL certificate validation logic. A TrustManager manages the certificates of all Certificate Authorities (CAs) used to assess a certificate’s validity. Only root CAs trusted by Android are contained in the default TrustManager. A HostnameVerifier performs hostname verification whenever a URL’s hostname does not match the hostname in the peer’s identification credentials. While browsers provide users with visual feedback that their communication is secured (via the lock symbol) as well as certificate validation issues, non-browser apps do so less extensively and effectively. This shortcoming motivates the need to scrutinize the security of network connections used by apps to transmit user sensitive data. We found that some of the most popular Android apps insufficiently secure these connections, putting users’ passwords, credit card details and chat messages at risk. Last term I had the opportunity and pleasure to prepare and teach the first course on Privacy Enhancing Technologies (PETs) at University College London, as part of the MSc in Information Security. The course covers principally, and in some detail, engineering aspects of PETs and caters for an audience of CS / engineering students that already understands the basics of information security and cryptography (although these are not hard prerequisites). Students were also provided with a working understanding of legal and compliance aspects of data protection regimes, by guest lecturer Prof. Eleni Kosta (Tilburg); as well as a world class introduction to human aspects of computing and privacy, by Prof. Angela Sasse (UCL). This security & cryptographic engineering focus sets this course apart from related courses. Norwegian writer Mette Newth once wrote that: “censorship has followed the free expressions of men and women like a shadow throughout history.” Indeed, as we develop innovative and more effective tools to gather and create information, new means to control, erase and censor that information evolve alongside it. But how do we study Internet censorship? Organisations such as Reporters Without Borders, Freedom House, or the Open Net Initiative periodically report on the extent of censorship worldwide. But as countries that are fond of censorship are not particularly keen to share details, we must resort to probing filtered networks, i.e., generating requests from within them to see what gets blocked and what gets through. We cannot hope to record all the possible censorship-triggering events, so our understanding of what is or isn’t acceptable to the censor will only ever be partial. And of course it’s risky, or even outright illegal, to probe the censor’s limits within countries with strict censorship and surveillance programs. This is why the leak of 600GB of logs from hardware appliances used to filter internet traffic in and out of Syria was a unique opportunity to examine the workings of a real-world internet censorship apparatus. Leaked by the hacktivist group Telecomix, the logs cover a period of nine days in 2011, drawn from seven Blue Coat SG-9000 internet proxies. The sale of equipment like this to countries such as Syria is banned by the US and EU. California-based manufacturer Blue Coat Systems denied making the sales but confirmed the authenticity of the logs – and Dubai-based firm Computerlinks FZCO later settled on a US$2.8m fine for unlawful export. In 2013, researchers at the University of Toronto’s Citizen Lab demonstrated how authoritarian regimes in Saudi Arabia, UAE, Qatar, Yemen, Egypt and Kuwait all rely on US-made equipment like those from Blue Coat or McAfee’s SmartFilter software to perform filtering.